Cellphone Records Could Help Predict Dengue Outbreak : Goats and Soda A team of researchers recently found that mobility patterns revealed by cellphone data let them accurately model the spread of a large dengue outbreak in two regions of Pakistan in 2013. 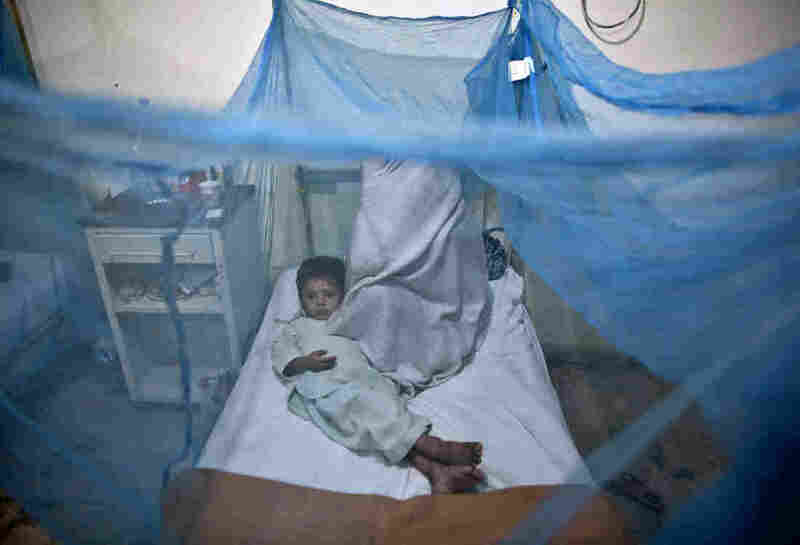 A child suffering from dengue fever lies in a bed in the isolation ward of a Rawalpindi, Pakistan, hospital in November 2013. There is no treatment for dengue, whose symptoms include fever, severe joint pain, headaches and bleeding. Cellphone records could help epidemiologists predict which cities and towns might be hit next by dengue, the most rapidly spreading mosquito-borne disease in the world. That's because cellphone records let scientists track how people actually move around, says Amy Wesolowski, a researcher who models epidemics at the Harvard T.H. Chan School of Public Health in Boston. Wesolowski notes that some countries, like the U.S., gather information on travel patterns and road usage, but this information often either isn't available or isn't reliable in the developing world. So, she and her colleagues have turned to cellphones. They recently found that mobility patterns revealed by cellphone data let them accurately model the spread of a large dengue outbreak in two regions of Pakistan in 2013. "It's an emerging infectious disease in Pakistan," says Wesolowski. "Southern Pakistan, near Karachi, has had dengue outbreaks for many years. But in northern Pakistan, around the Punjab region and even farther north, they've more recently had dengue outbreaks in the last few years." The team got access to the records of 40 million customers of the phone company Telenor Pakistan. The records covered the period from June through December 2013 and had been processed and anonymized to protect privacy. The amount of data was very large, says Wesolowski. "It would break a normal computer." The cellphone data, added to climate information, could have been used to accurately predict both the geographic spread of this disease and its timing, according to a report in the Proceedings of the National Academy of Sciences. "So, for example, up in Mingora near Swat Valley, there was a large epidemic there. The mobile phone data was able to predict when the first cases were likely introduced," says Wesolowski. A simpler epidemiological model they tested, without the cellphone data, was not able to predict that it would have ever been introduced in that part of the country, she says. Trying to do this kind of prediction in real time, however, would be difficult as researchers would need to access cellphone data and process it quickly. But Wesolowski hopes this kind of information will help public health workers create more updated dengue risk maps that take into account not just climate and how it could let mosquitoes spread, but also how people move around.